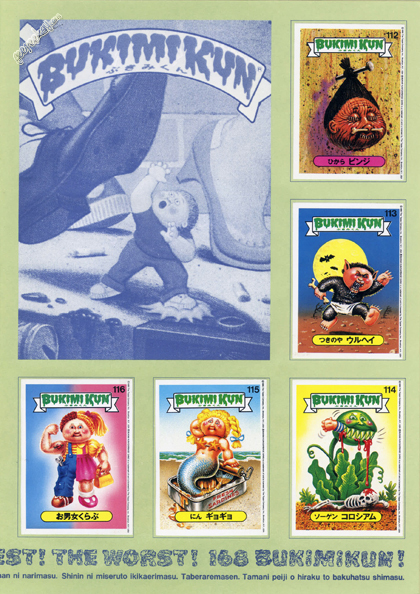 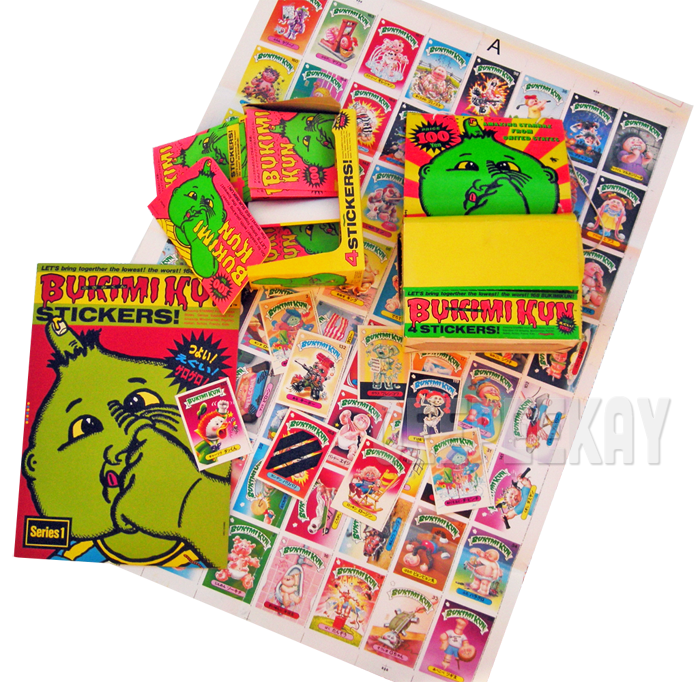 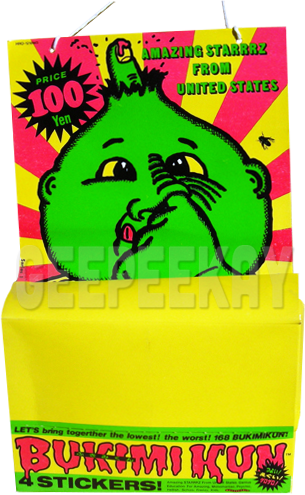 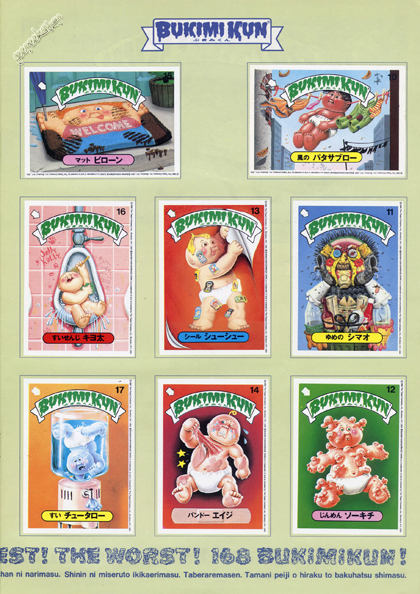 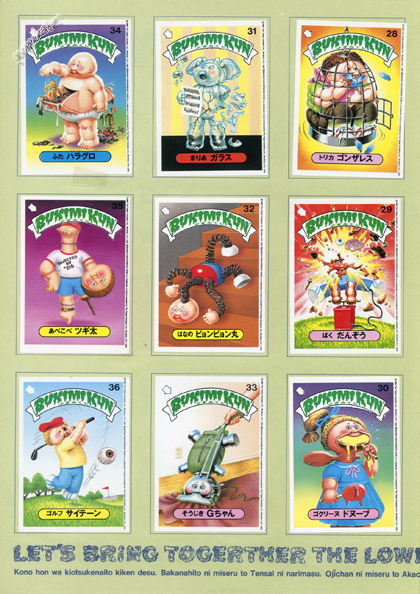 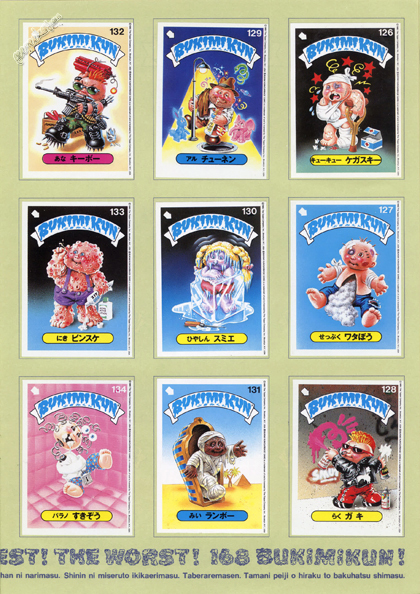 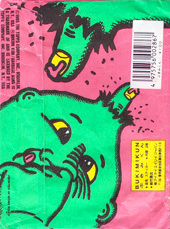 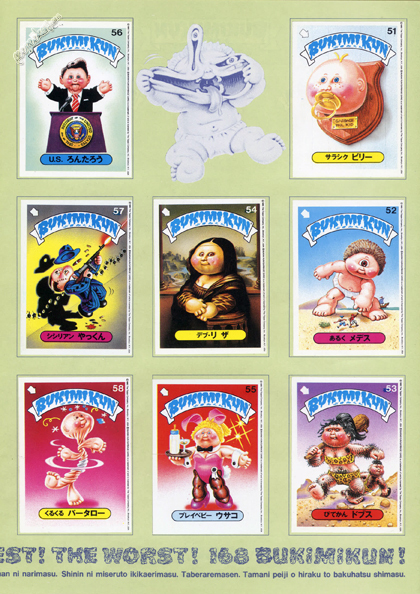 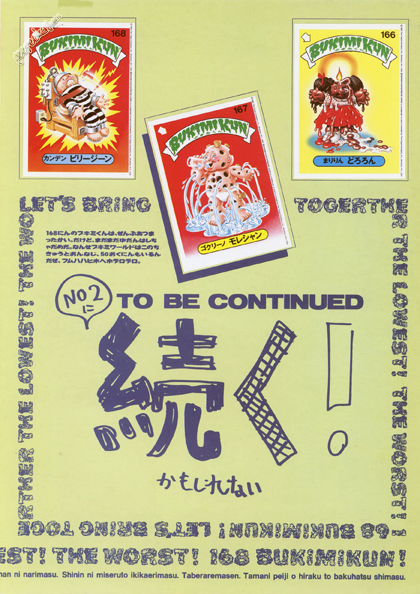 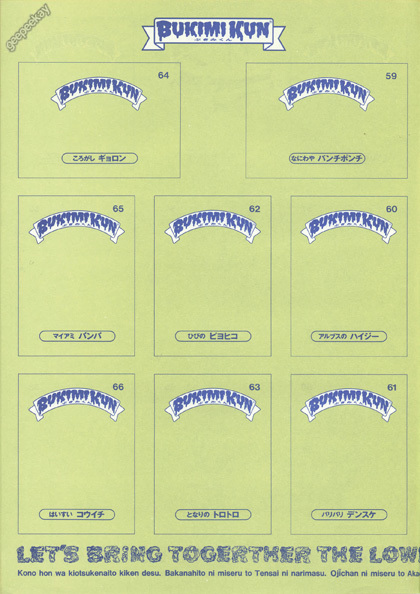 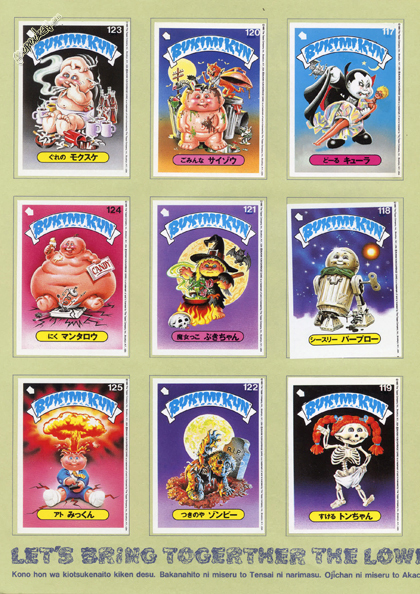 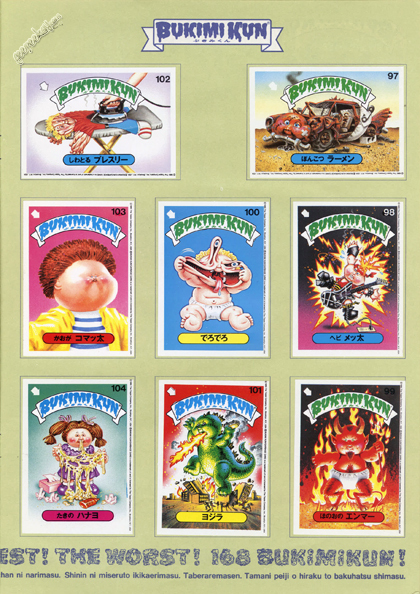 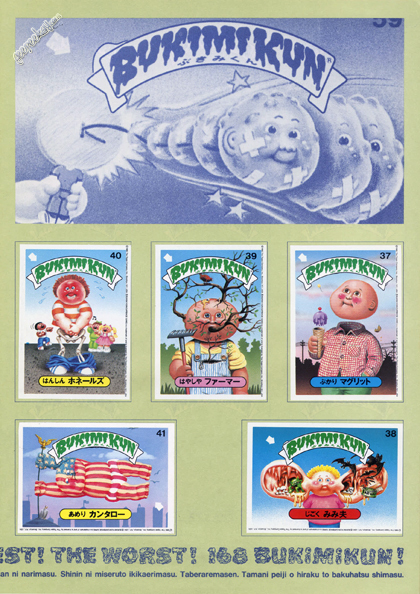 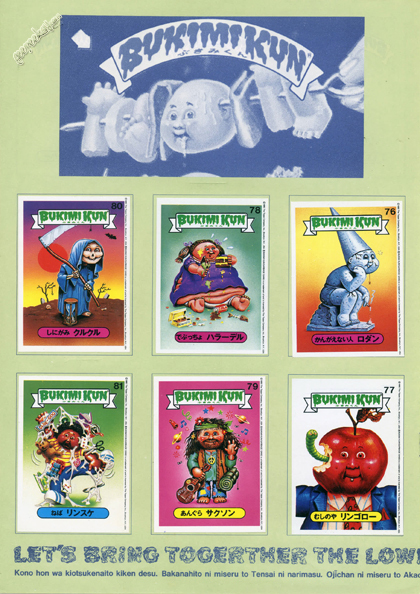 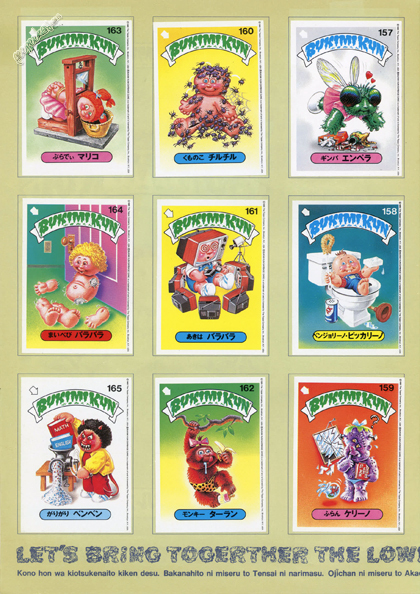 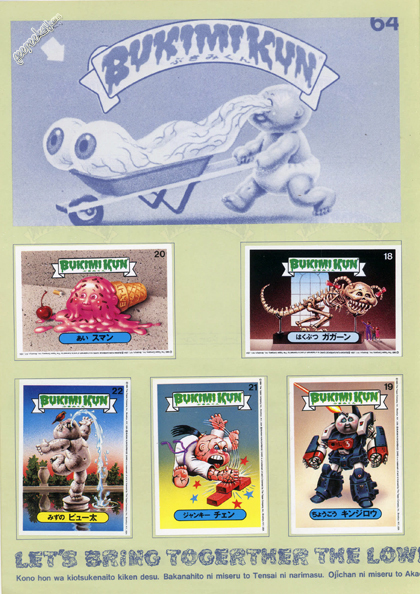 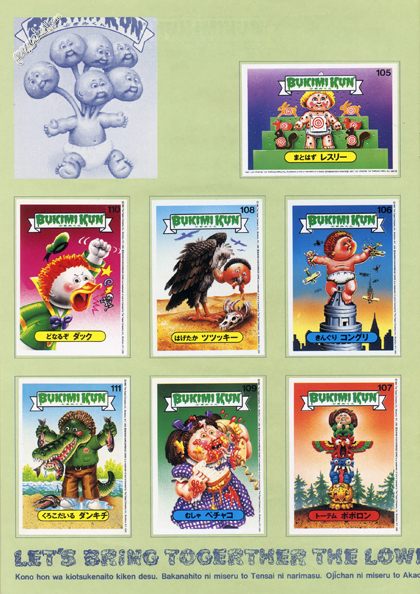 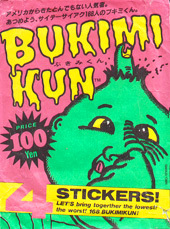 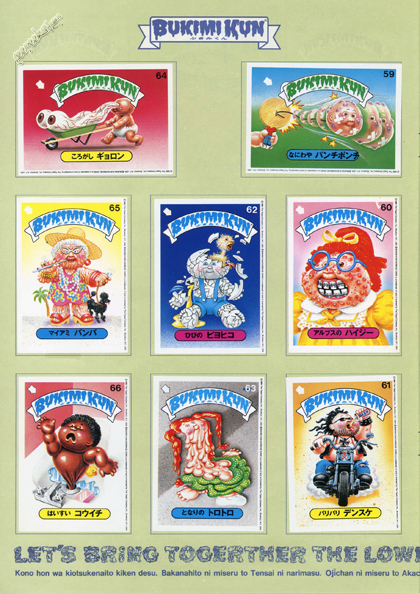 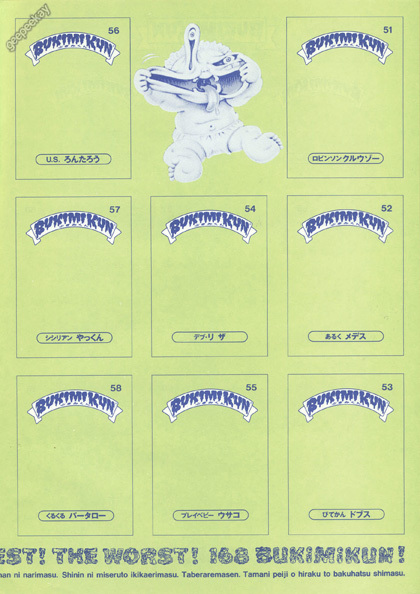 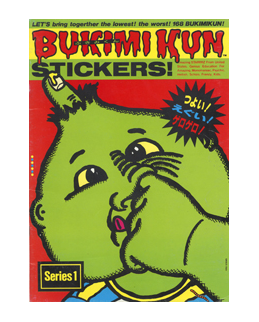 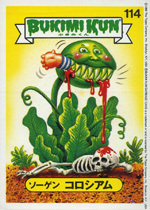 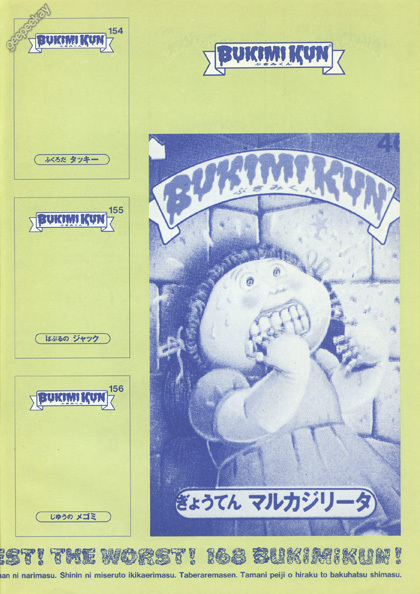 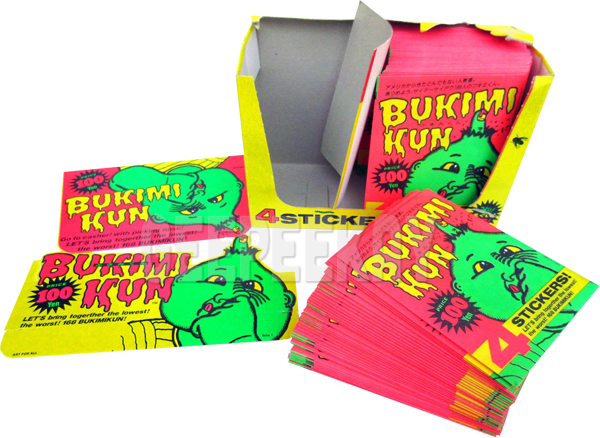 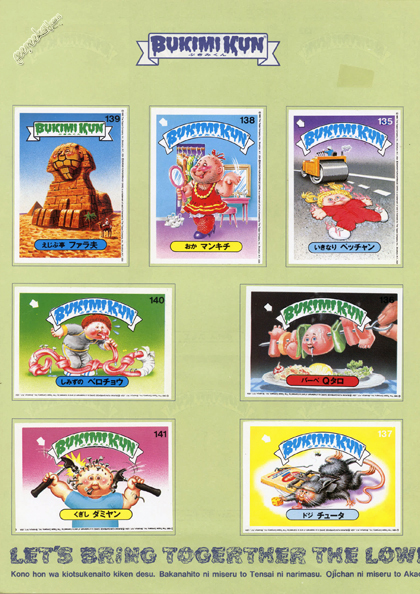 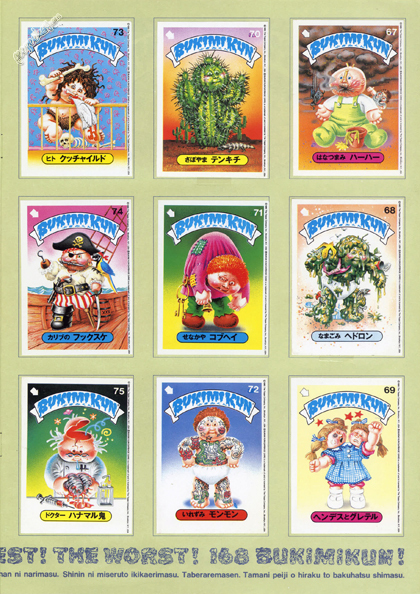 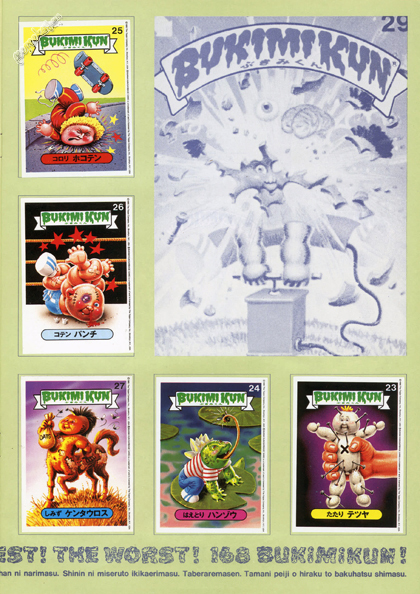 Japan released a version of Garbage Pail Kids called BUKIMI KUN that has proven to be one of the most rare and sought-after foreign GPK releases. 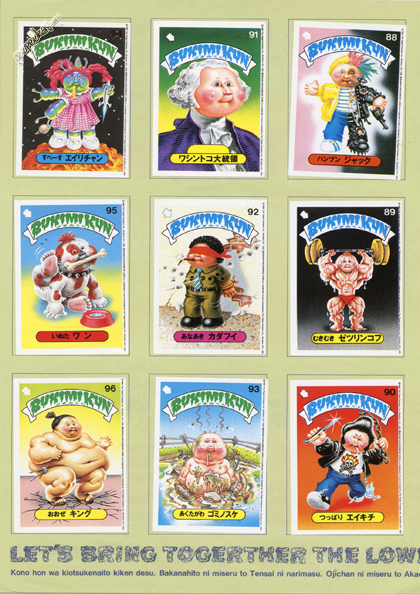 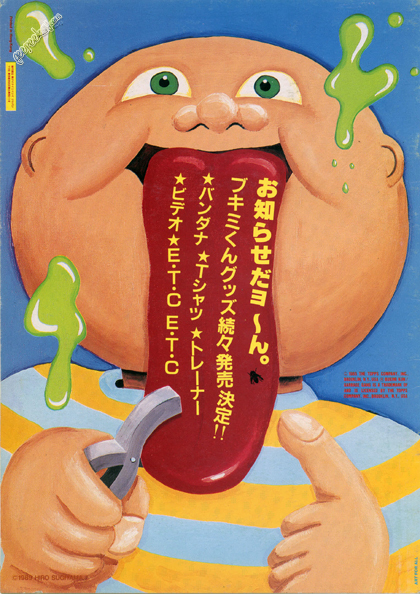 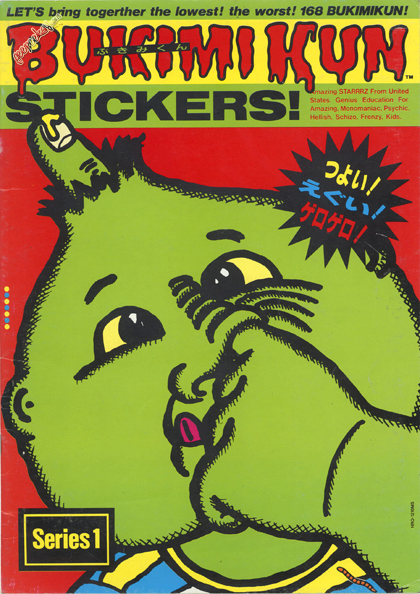 One of the most interesting and unique aspects of the foreign GPK release from Japan was the album that accompanied the release. 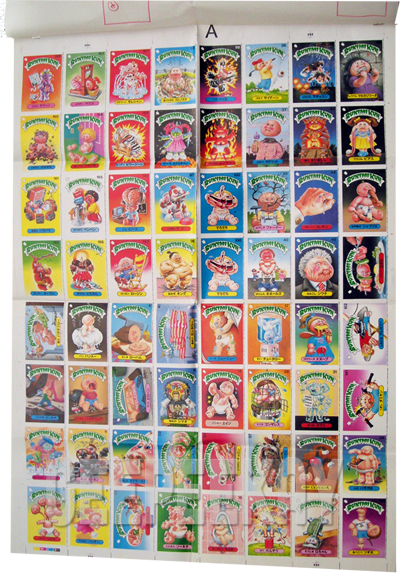 This album featured numerous pages that were for the collector to peel and stick their Garbage Pail Kids stickers. 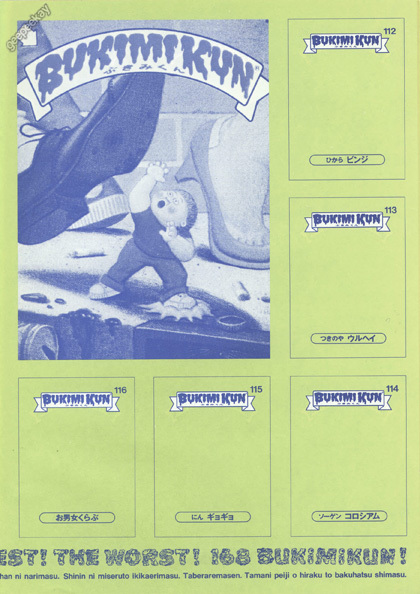 It also featured advertisements and information for other products. 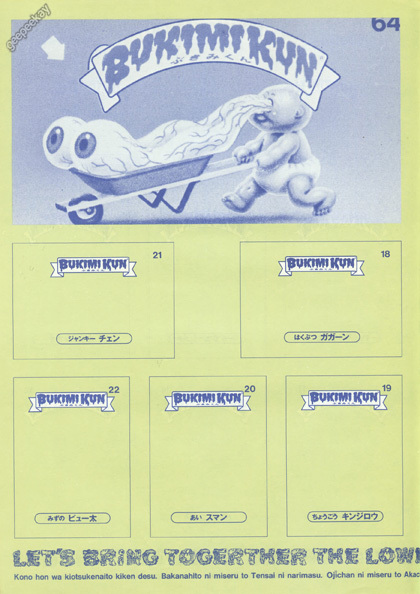 What makes the album from Japan even more amazing is that until September 2010 there was no evidence an album even existed. 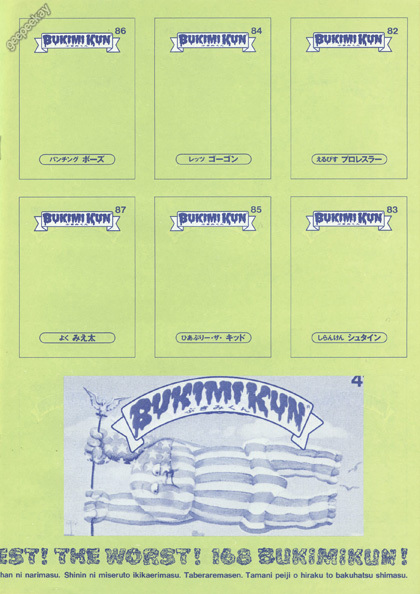 Then, out of nowhere, a collector from Illinois showed up on the scene with not one, not two, but THREE albums from the Bukimi Kun series. 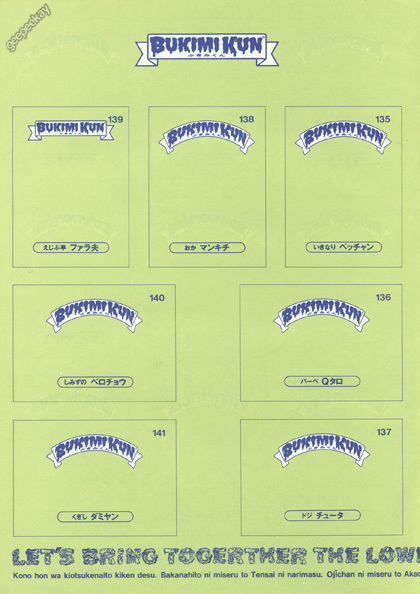 One album was complete, one was empty, and one was just the front and back cover. 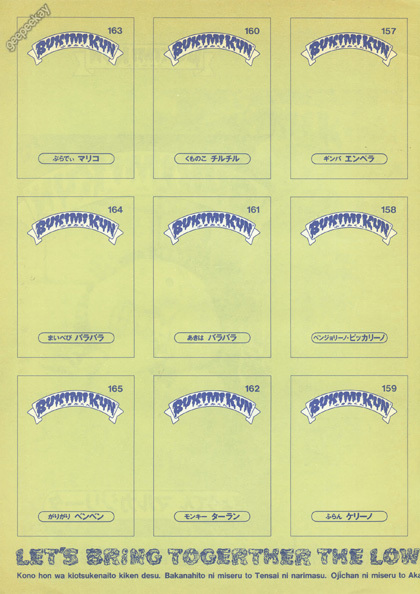 Below is a hi-res gallery of the entire album - both empty and full - for collectors to browse through and get a better understanding of this super-rare foreign release. 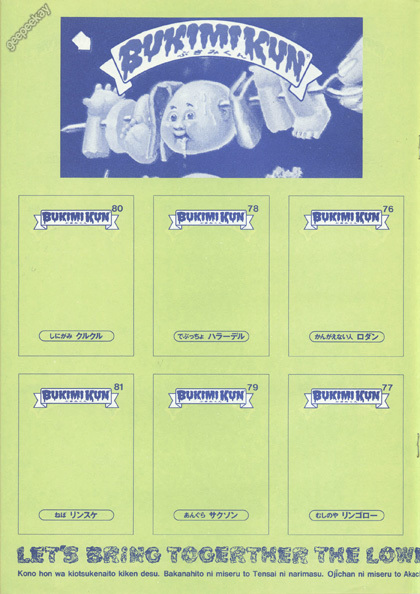 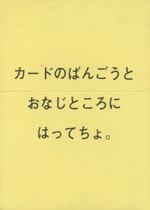 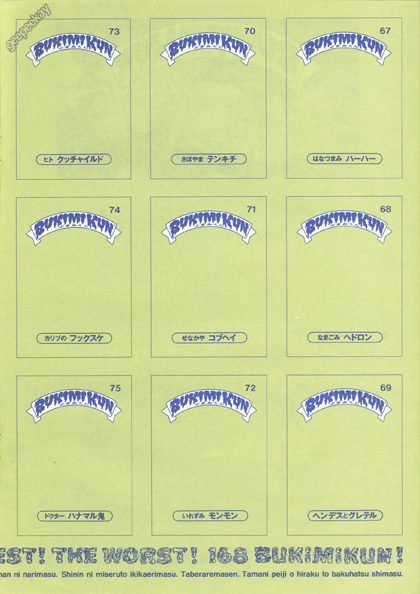 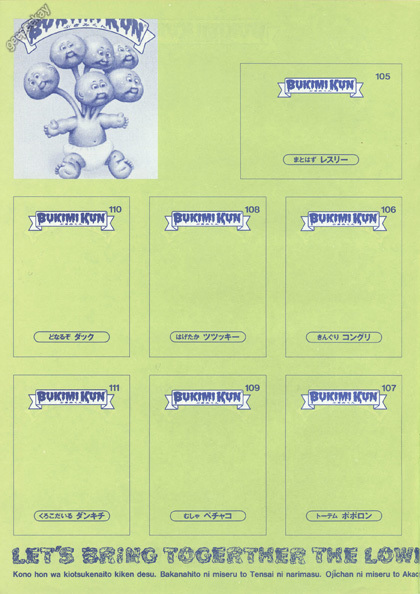 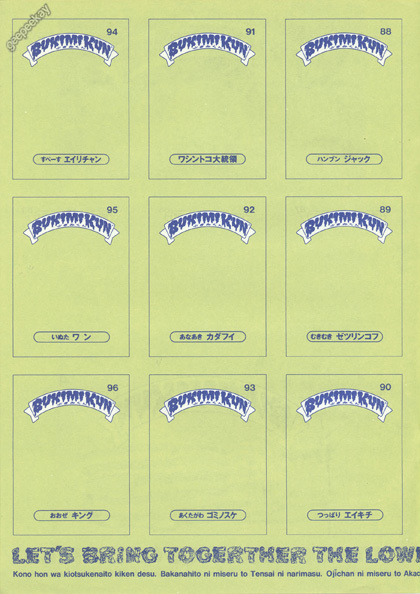 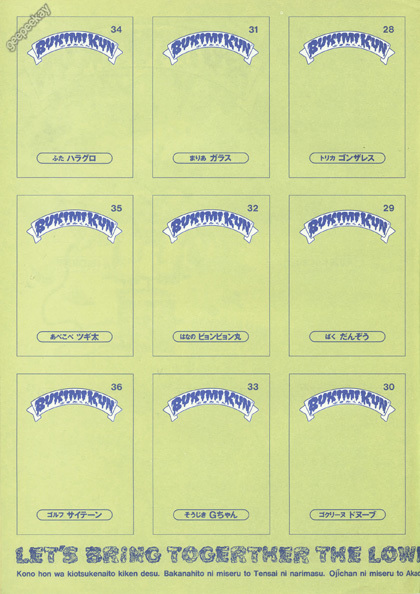 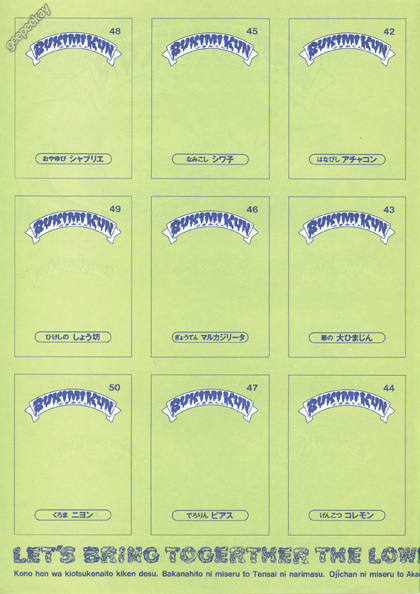 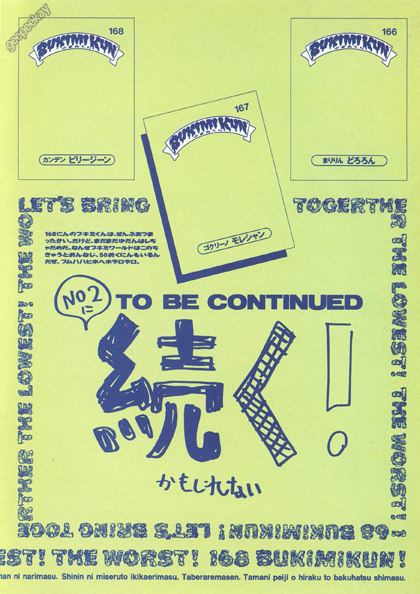 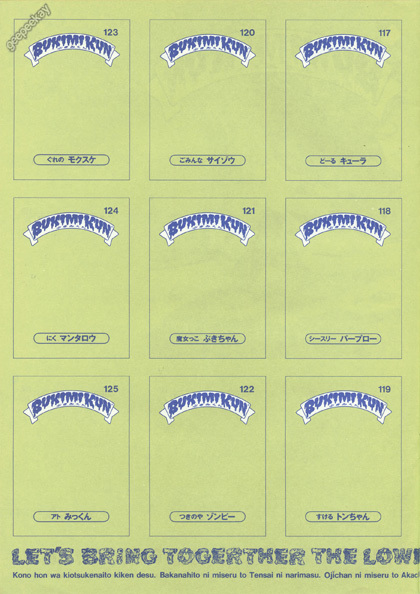 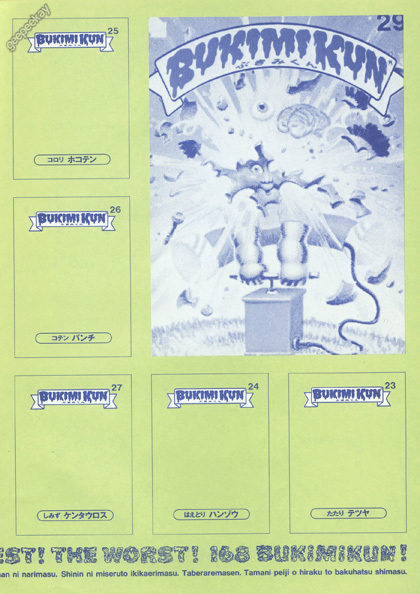 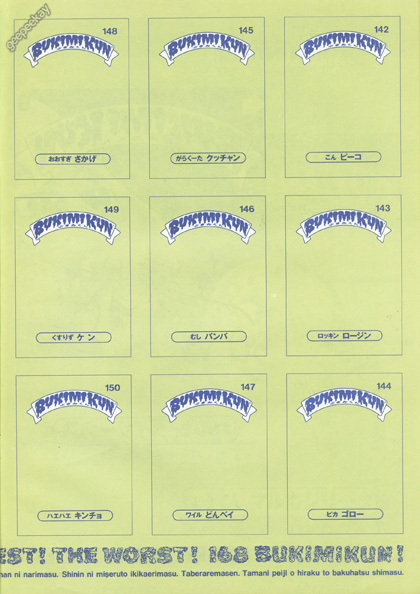 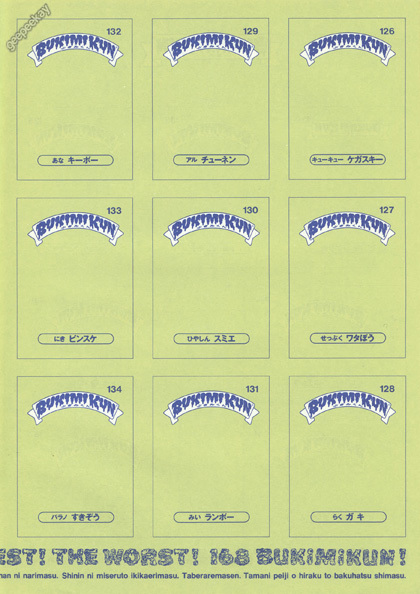 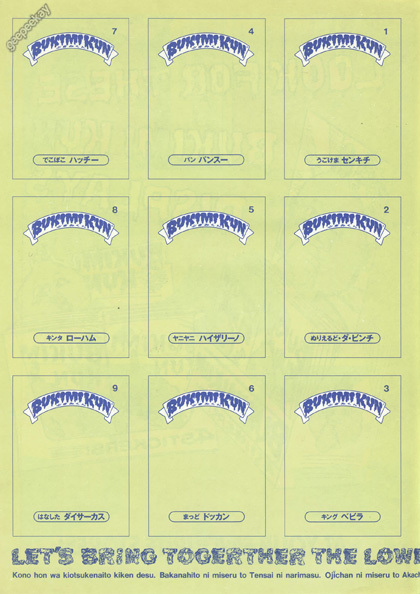 Below are scans of a FULL Bukimi Kun album from Japan. 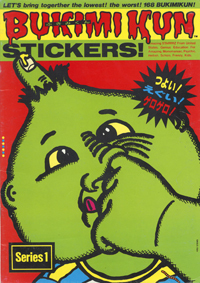 Nowhere else can you browse through the entire album seeing every page, and every sticker placed in the appropriate location. 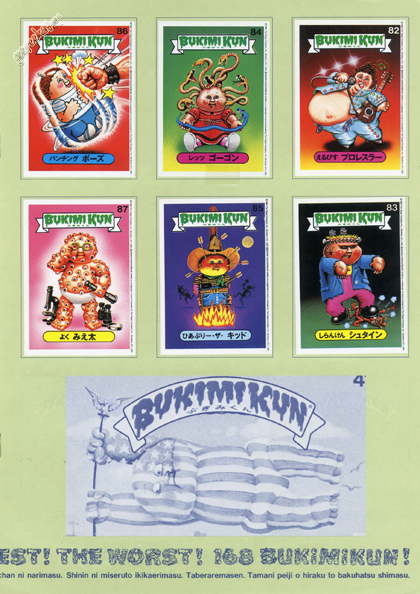 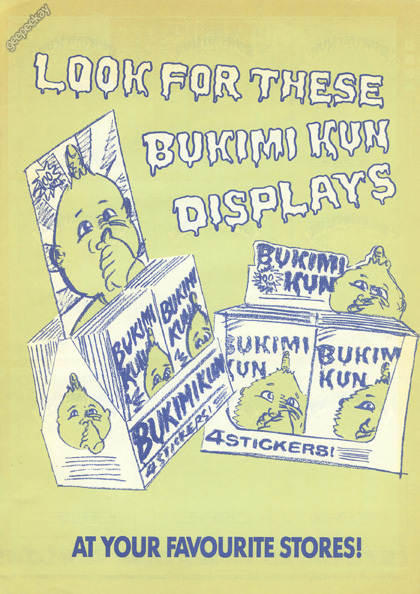 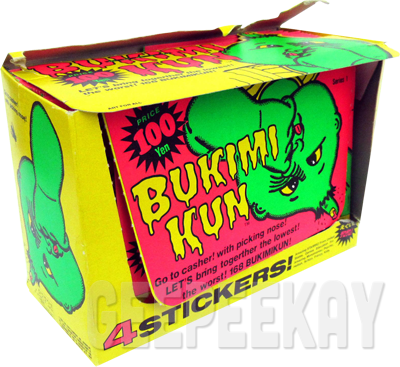 The picture below provides an example of every possible Bukimi Kun collectible item that is known to exist. 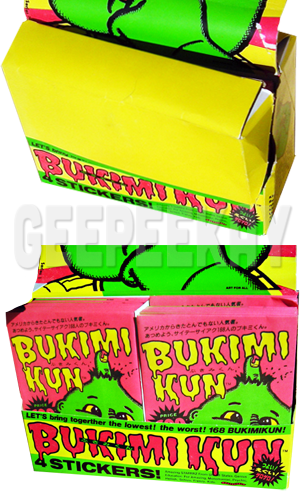 Bukimi Kun represent the ultimate challenge for collectors due to their rarity and extremely high value. 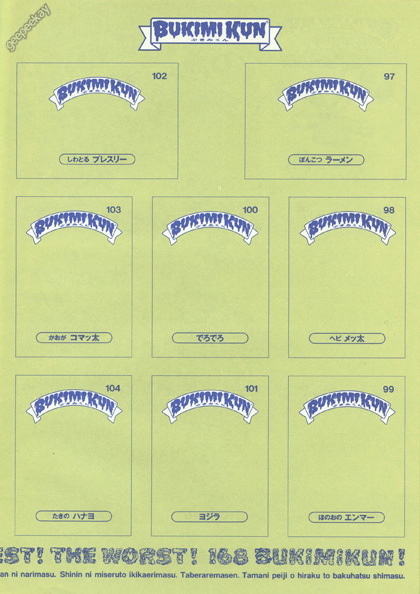 Hopefully this page helps people better understand this amazing, rare, and sought-after section of the hobby. 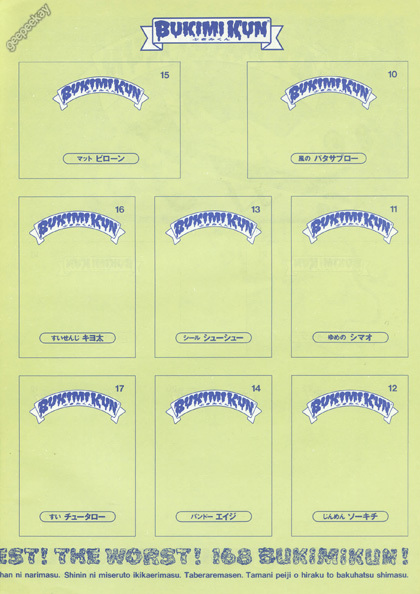 To date Japan has only released one series, so the timeline is fairly simple. 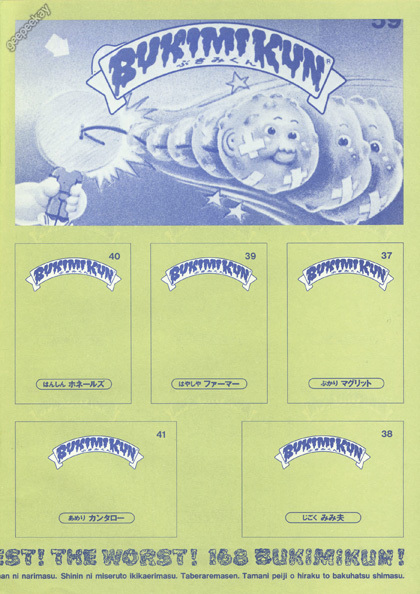 Below is a glimpse at not only when the series was released, but also how many stickers were included as part of that release.